Shield Symbolism: The 11th Field Artillery served in France with the 6th Division, its battle service being in the province of Lorraine. The arms of Lorraine have three alerions on a red bend, the field being gold to which is added to the insignia of the 6th Division. The crest of the canton represents formation of the regiment by transfer of personnel from the 6th Field Artillery. The crest is a black lion rampant taken from the arms of Stenay in commemoration of the principal action of the regiment, which was in support of the 89th Division during the crossing of the Meuse near Stenay. The insignia of the 6th Division is in the lion’s paw. Crest: On a wreath of the colors, or and gules, a lion rampant sable, langued gules, grasping in his dexter paw a six-pointed mullet as on shield. Constituted 1 July 1916 in the Regular Army as the 11th Field Artillery. Organized 1 June 1917 at Douglas Arizona. Assigned in November 1917 to 6th Division. Relieved 12 November 1920 from assignment to the 6th Division. Assigned 1 March to the Hawaiian Division (later designated the 24th Infantry Division). Relieved 31 March 1958 from assignment to the 24th Infantry Division. 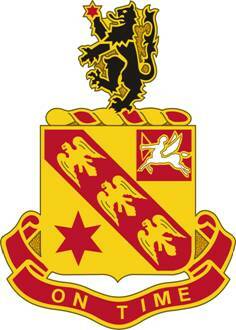 2nd Battalion, 11th Field Artillery, currently assigned to the 25th Infantry Division (Light).